The answer is crucial, as this fragility is involved in the development of tumors. A team from the Institut de Génétique et de Biologie Moléculaire et Cellulaire (CNRS/Inserm/Université de Strasbourg) has partially lifted the veil on the mystery. Laszlo Tora and his colleagues have discovered that breakages in the longest human genes are due to a phenomenon previously considered improbable in mammalian cells: an interference between two key gene processes, DNA transcription (1) and replication (2). Published in the review Molecular Cell of 23 December 2011, this work could give rise to novel anti-tumor strategies in the longer term. Tora and his colleagues began by studying the transcription of very large human genes (over 800 kilobases (3)), known to exhibit DNA breaks called “common fragile sites”. They hypothesized that, since the time required for the transcription of these very large genes is extremely long, the transcription process could be involved in the appearance of fragile sites. To test their hypothesis, the researchers used the flow cytometry technique, which enabled them to sort the cells according to their progression through the cell cycle (4) – cells in the G1 (gene transcription and cell growth), S (DNA replication), G2 (growth and preparation for cell division) and M (cell division) phases. It appears that the transcription of very large genes far exceeds the duration of the cell cycle, and is only completed in the early stages of the following cycle, in the G1 or S phase. This comes as a surprise since gene transcription in mammals was thought to occur within a single cell cycle and mainly in the G1 phase. Since replication takes place in the S phase, the researchers suspected interference between transcription and replication to explain the breakages in very large mammalian genes. They studied the replication process in these genes and found out that replication in the fragile site region takes place at the end of the S phase, while transcription is still ongoing in the same regions! This discovery revolutionizes current genetic knowledge, as it was generally admitted that DNA transcription and replication in mammals could not take place at the same time. The team went further and sought to elucidate what could weaken DNA when replication and transcription happen simultaneously. They highlighted lasting loop structures, caused by the hybridization of DNA with the RNA molecule produced during transcription. These DNA/RNA loops could destabilize DNA and cause breakages in the event of stress. This major discovery opens new perspectives in terms of medical research: the famous loops appear as potential targets for reducing genomic instability and the onset of tumors. Left: Chromosomes without breaks are perfectly symmetrical. 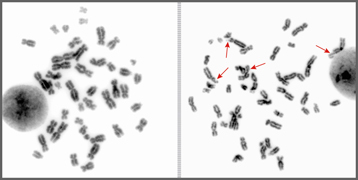 Right: Chromosomes with breaks have led to rearrangements. (1) The process during which DNA is copied into RNA. This RNA is then “translated” into proteins to allow the cell to work. (2) The process enabling DNA to split in two prior to cell division. (3) The size of DNA is measured in kilobases (1 kb = 1000 DNA bases). (4) The four phases of cell division, namely: G1 (gene transcription and cell growth phase), S (DNA replication), G2 (growth and preparation for cell division), and M (division). Collisions between replication and transcription complexes cause common fragile site instability at the longest human genes. Anne Helmrich, Monica Ballarino and Laszlo Tora. Molecular Cell. 23 December 2011.